I'm fortunate enough to work right above DC's first Wawa, which opened in December to great fanfare. It has a cult-like following in parts of the mid-Atlantic region and cheap, better-than-your-regular-convenience store food and coffee. Since the Wawa opened, it's been one of my go-to options for an ultra-quick, ultra-cheap lunch, snack, or coffee during the day. And it's open 24/7. What's not to love? Apparently, I'm not the only one who digs this shiny new calorie and caffeine option. Since it opened, and particularly since New Year's, I've noticed a steady stream of emergency responders - police, uniformed Secret Service (they have an office around the corner), firefighters, and ambulance personnel - gravitating to the Wawa for early-morning breakfast and coffee, particularly before 8:00 am. Which is great, except for the fact that they routinely park their vehicles - patrol cars, ambulances, and even full-sized fire trucks - on 19th street to make their coffee/food runs. 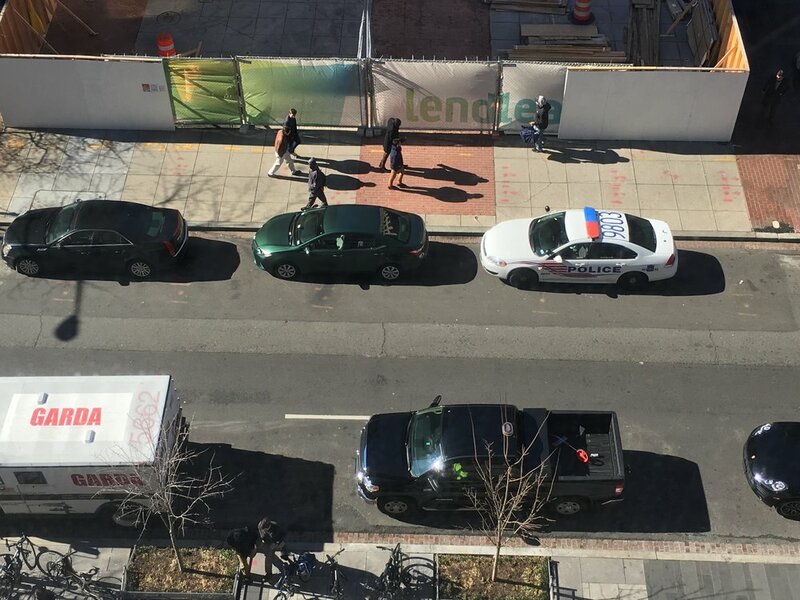 Which is less than cool since a) there is no curb parking at any time of the day on three-lane 19th, and b) 19th is already an overly congested and important artery connecting Dupont Circle to downtown Washington. As a cyclist, it's particularly worrying given how many cycling commuters use 19th to get to work in the morning; those parked vehicles create major traffic disruptions and pose a non-trivial safety hazard to drivers and bikers alike. Before anyone accuses me of being mean-spirited, I'm the first to acknowledge and celebrate the sacrifices made by first responders in doing their jobs. They work terrible hours, are generally paid poorly, and have to put up with all sorts of insanity and stress that us office workers never have to face. Tip o' the hat. But: we're all supposed to play by the same rules, right? And those rules include common sense public safety standards, like not blocking a downtown artery in rush hour because there's cheap coffee inside. 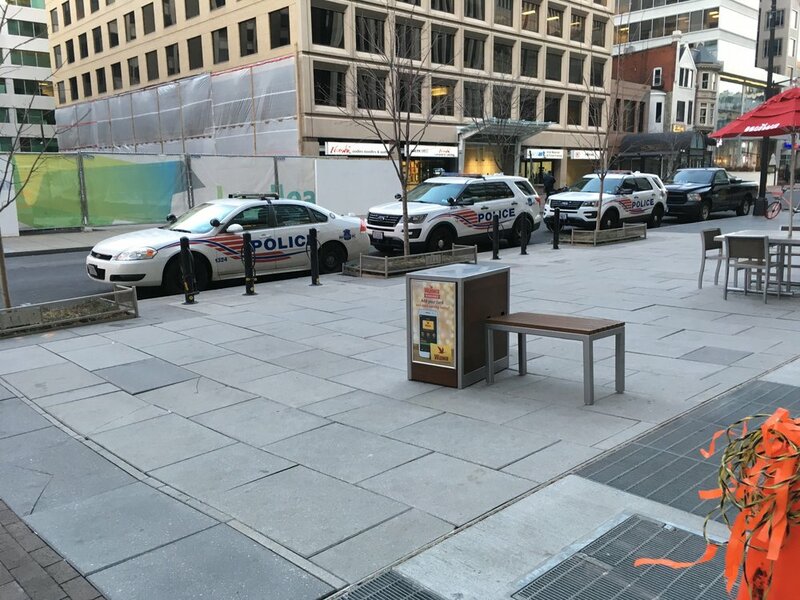 I did a cursory search around the DC Code online to try and understand if emergency responders are granted some sort of parking exemption that allows them to park any/everywhere, at least in carrying out official duties. I didn't come across anything. Then again, I'm no expert in DC law and regulation, and if readers know of such an exemption, please shout in the comments below so that I can reel in my frustration. But until then: what the heck, DC emergency responders? !